Experience the passion and history of tango on this 3-hour walking tour of Buenos Aires' tango venues and other hot spots. 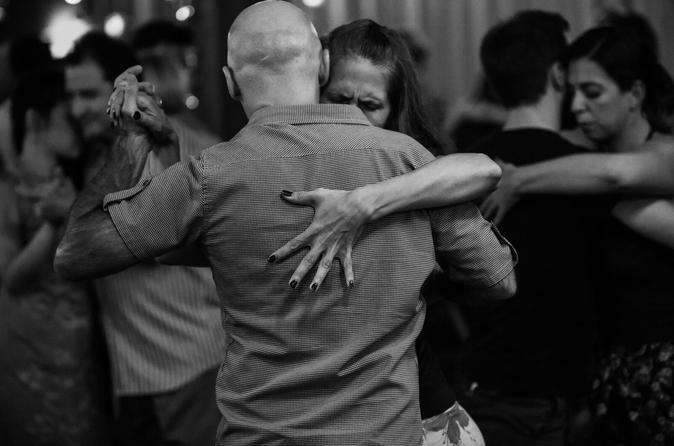 Learn where tango started and how it has evolved, watch couples practice to traditional Argentine tango music and try a few steps yourself. Guided by a seasoned tango dancer and expert guide, you'll visit some 'milongas' and other historical tango venues in the city where this dynamic dance was born. Meet your expert guide at a famous French coffeehouse in downtown Buenos Aires. A favorite haunt of the late tango singer Carlos Gardel, this venue makes an appropriate place for you to begin learning about the history and culture of the tango from your expert guide, also a seasoned tango dancer. Enjoy a drink on the house and put yourself in the shoes of the generations of dedicated Argentinian tango dancers, or milongueros. Learn about Buenos Aires' historic San Telmo neighborhood, where immigrants invented tango during the 1850s. The colorful buildings and eclectic architecture were the backdrop for the choreography of claps, steps and stomps that make up this expressive dance. Stroll into a local milonga (or dance hall) armed with your newfound knowledge of the dance and its history. Listen to classic tango music as you observe the locals practicing their steps. Feel free, if you're brave, to jump in and try a few steps yourself. Finish your tour here: in a seat in the audience with a drink in your hand, or on the dance floor — the choice is yours.